With our unique Ski Search Agent for ski holidays you can both search ski packages from ski operators but also create your own ski package by combining a cheap flight and a cheap hotel yourself. With a single search you will search for flights, accommodation and ski packages to the Alps, USA and Canada as well as other European ski resorts. Ski packages found on tab Ski operators in search results. Notice that flights and hotel must be booked separately and that airport transfers, ski passes and ski equipment usually are not included. Notice that prices could be converted from local currency and could vary with prices displayed on the hotel supplier web site. All hotels are not located within the ski resort. Use the maps to locate hotel and always check carefully where the hotel is located on the supplier web site before you book! FindSkiHolidays.com cannot be held responsible in case hotels are incorrectly located on maps. We display closest airports by shortest distance by air. This does not always correspond to being the most convenient airport. We do not take on responsibility for your selection of airport. From which city and when? What ski resort and when? 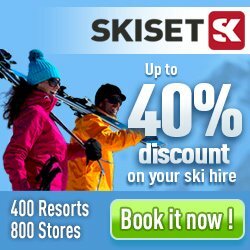 Ski rental - rent equipment with up to 50% discount!